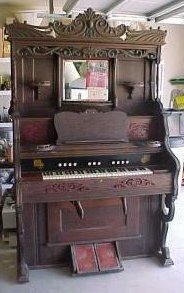 Fenland Pianos also repair and rebuild most types of reed organs, Harmonums and American Organs, including player organs. 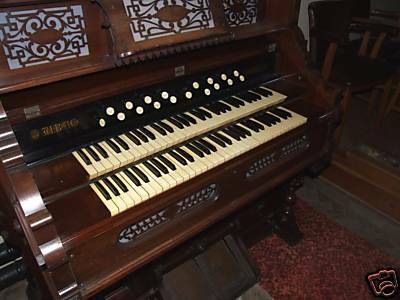 Harmoniums work off compressed air, like church organs, and American Organs work off suction, as do pianolas. Reed organs, in all their many forms, were popular from around the 1860's to the early 1900's.A surprising number have survived to the present day. They can often be obtained quite cheaply, but seldom give of their best due to their age. However, most of them were well built, and after a complete rebuild, will perform the way they were originally intended. The real magic of a reed organ lies in the fact that the sound being produced is real. Not from eletronic circuits and loudspeakers, but from brass reeds which vibrate and move the air. And a well restored reed organ is a pleasure to play and listen to. 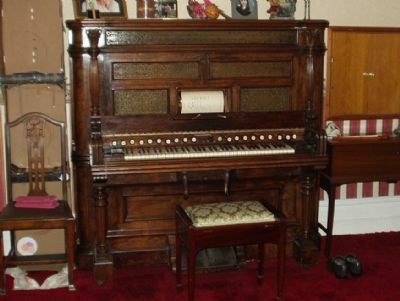 Most home reed organs have but one 5 octave keyboard, plus a variety of stops which alter the tone of the sound being produced, and knee operated levers which increase the volume of sound produced. 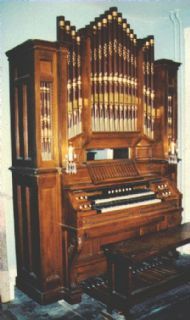 There were a few larger instruments built with 2 or more keyboards, and some even had a pedal board, making them the ideal practise instrument for those learning the church organ. Although the number of larger instruments produced were relatively small, they do turn up from time to time. 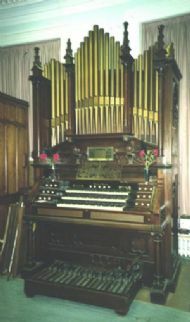 Player organs were also produced around the turn of the century. These operate from either compressed air or suction, and play from paper rolls, or playable from a keyboard, in a similar way to player pianos. Most of these instruments were quite large, requiring a large room in which to display them, the most popular being the Aeolian Orchestrelle. These instruments produce a very good sound, much better than the average reed organ.